In 1946, future pharmaceutical czar George Merck reported to the US Secretary of War, that he'd managed to weaponise the toxin extracted from the Brucella bacterium and to isolate it into an indestructible crystalline form using only the DNA particles. 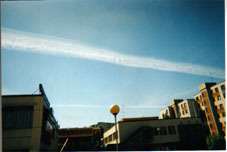 Aerial spraying of the crystals via chemtrails was deployed on Chinese and Korean populations during the Korean War. Many veterans of the war later developed Multiple Sclerosis. The army recognized that the MS was Brucella-related and paid the veterans compensation. Although the Brucella micoplasma can lay dormant for decades, it can be triggered by vaccines. Vaccines have been mandatory in the US military since 1911. So yesterday as some of you already know on the cable (timewarner) channel of the science channel they did a whole show on weather modification and let me tell you it was incredibly informative and not as chintzy as one would expect to see on tv. I wrote down what I could as our vcr does not work so here is what I got... This company manufactured and then later sprayed this gelatinous substance and they dropped tons of this stuff (looks just like dippity doo hair gel) into a cloud and the blobs simply fell to the ground. The owner of this privately owned company is Peter Cordoni(sp). 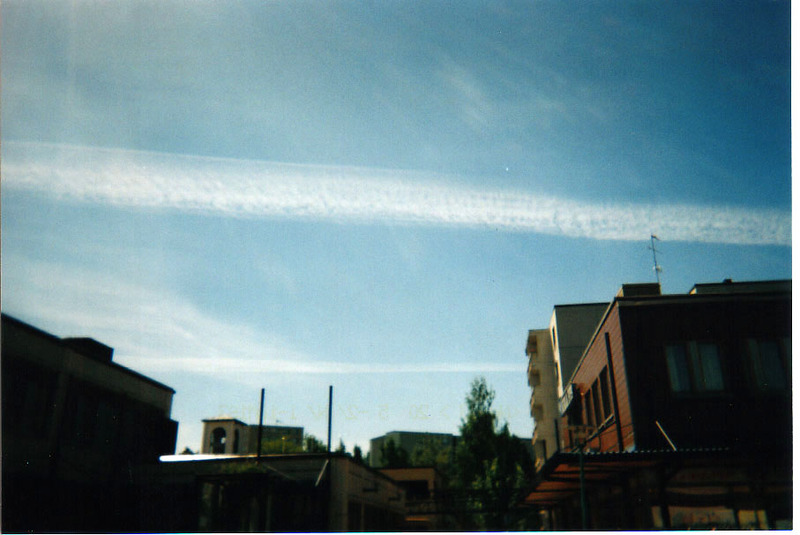 The spraying of powdered materials throughout the skies of the world is happening on a daily basis everywhere. This has been going on with increasing frequency since the so-called "Election" of the bush crime family to leadership positions in America. 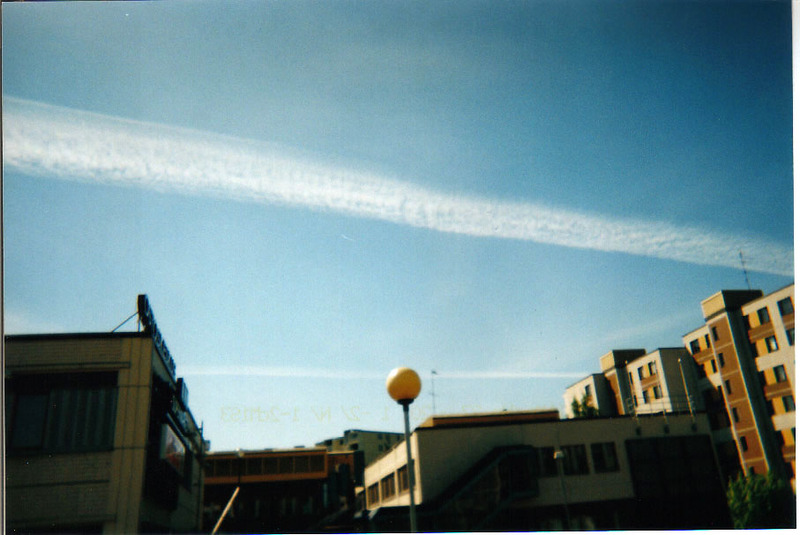 Hardly a day goes by now where jets do not lay down chemical trails in grids and canopies. This is support for technology being used against the population of the world. Its main goal is control of food and water through weather modification, but the vast vast expense of this program, as well as the classified technology of corporations such as Time Domain Corporation, suggest even greater goals are being obtained in conjunction with the attempt to lock down food and water. Monsanto Corporation is also deeply involved in this illegal take-over, and many others. Electro-sensitivity of the soil itself will only allow GM crops to crow eventually. Get it? I knew you would. This text is copied from The Bankindex who claim NOT know who he or she is. The piece came in through one of theirr forms and the Author left an unusable e-mail address. An illusion it will be, so large, so vast it will escape their perception. King of Kings' Bible Rev 12:9 And the great dragon was cast out, that old serpent, called the Devil, and Satan, which deceiveth the whole world: he was cast out to the earth, and his angels (you - Luke 9:55) were cast out with him (Matthew 25:41). Professor of Economics, University of Ottawa, author of The Globalization of Poverty, second edition, Common Courage Press, 2000. The important debate on global warming under UN auspices provides but a partial picture of climate change; in addition to the devastating impacts of greenhouse gas emissions on the ozone layer, the World's climate can now be modified as part of a new generation of sophisticated "non-lethal weapons." Both the Americans and the Russians have developed capabilities to manipulate the World's climate. In the US, the technology is being perfected under the High-frequency Active Aural Research Program (HAARP) as part of the ("Star Wars") Strategic Defence Initiative (SDI). Recent scientific evidence suggests that HAARP is fully operational and has the ability of potentially triggering floods, droughts, hurricanes and earthquakes. From a military standpoint, HAARP is a weapon of mass destruction. Potentially, it constitutes an instrument of conquest capable of selectively destabilising agricultural and ecological systems of entire regions. Of course, excess aluminum would impact on the respiratory tract.